The Frelinghuysen Morris House & Studio is the preserved home, studio, collections and environs of American Abstract artists George L.K. Morris and Suzy Frelinghuysen. The summer marks the 20th anniversary of the site opening to the public. While of a completely different era and sensibility than Daniel Chester French’s Chesterwood, as sites that exist only ten miles from each other in the adjoining towns of Lenox and Stockbridge, MA—These two Berkshire treasures can be considered “sister” HAHS sites. Even in their differences, these two sites share something fundamental in common; originally serving as country retreats for artists who held primary residence and studio spaces in New York City. The lush and inviting landscapes make both the Chesterwood and the Frelinghuysen Morris properties speak to places of inspiration, reinvigoration and conviviality – for personal use and artistic practice. As the stewards of the Frelinghuysen Morris House & Studio (Lenox, MA) celebrate this benchmark anniversary season, they should be commended for the outstanding preservation, restoration and innovating programming they have accomplished throughout their tenure, and specifically within the last several years. In a region of Massachusetts best-known for Gilded Age architecture, the Modernist home George L.K. Morris and Suzy Frelinghuysen designed as retreat and artistic hub, stands as both early and unique example of International style in the United States. 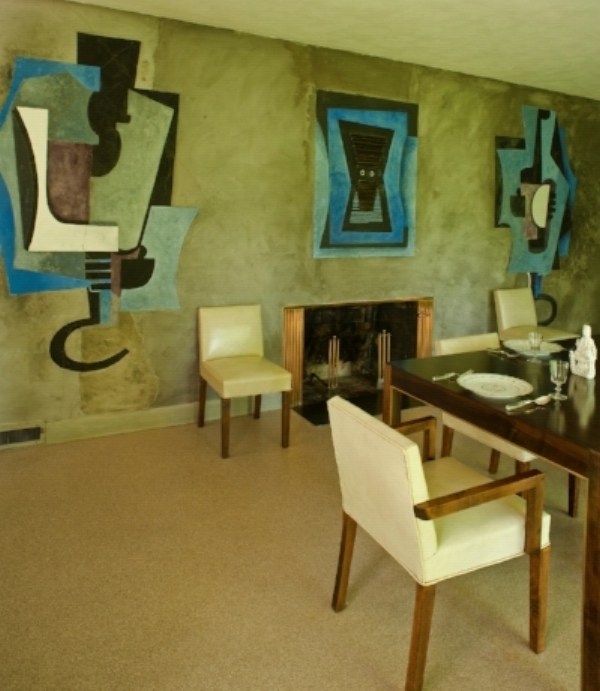 Replete with experimental architectural elements including in-situ artworks in fresco by both Frelinghuysen and Morris, as well as important examples of American and European cubist art, modern furniture and decorative arts, this holistic artistic environment provides enchantment for every visitor; and challenges for those responsible for its care. Both the building and its contents are exemplary in national significance, serving to illustrate the collective vision of two influential artists, while also encapsulating a significant era in our nation’s cultural history. The site represents strong dedication to preservation, conservation and restoration best practices, with a strong focus on direct activation of the site to serve local community, while also providing excellent visitor experience for those devotees who make the pilgrimage to this modern wonder of the Berkshires. This small, private non-profit foundation has grown from a burgeoning public site to a model for what creative placemaking can offer. Suzy Frelinghuysen planned for the long-term legacy of this site as a public institution during her own lifetime, entrusting her nephew Kinney Frelinghuysen to secure its future after her death. Today, Kinney serves as Executive Director, assisted by a full-time staff of four, including his wife Linda, who serves as Communications Director. Over two decades, Kinney and Linda have thoughtfully and carefully preserved and restored many aspects of the site, which includes an original 1930 studio built by Morris based on Ozenfant’s Parisian studio by Le Corbusier, which Morris had seen while studying abroad. In 1941, Morris and Frelinghuysen hired local architect John Butler Swann to design a house which would integrate with the earlier studio. Preservation projects on both buildings have included repair to a garage breezeway fresco by Morris, stabilization of exterior walls, the faithful replacement of the parlor’s original Argentinian leather floor, and most recently, the complete restoration of the debilitated marble rear patio. Many designed elements of the house are experimental in nature, whether it be materials, construction or design, and therefore all projects have required an approach employing sensitivity to original artistic intent, exploratory research as to historical accuracy, and innovative approaches for preservation solutions. Staff and volunteers have worked with experts to identify and then conserve furniture and objects in the collection, which were previously unattributed. This work has brought to light rare and important examples from this period, personally selected by Morris and Frelinghuysen for their home. The extensive art collection has required constant and careful stewardship. In addition to this work, the site has received multiple grants for the protection of the vast archive holdings, including digitization of early travel films made by the couple. The site actively loans its impressive collection of artwork (Morris, Frelinghuysen, and collected master works) to exhibitions throughout the world. The site’s annual exhibitions are notable for creativity, including the most recent, which displays both sides of various paintings at once, enabling viewers to learn about art-making and history through direct observation. Community engagement on all levels is impressive. Significant is the continued programmatic relationship with students and teachers of the nearby Morris Elementary School, which boasts a rare mosaic created and donated by Morris. Kinney Frelinghuysen, an artist himself, has worked to develop interpretation that assists the visitor with understanding Modernist art: public tours, special programming including “Unlock you Creativity” workshops for adult learners, guest-speaker lectures by noted historians and preservationists, and professional painter practicums conducted by leading contemporary artists. Be sure to make it a must see on your next visit to the Berkshires and don’t miss the Morris mosaic at the Morris Elementary School as you drive by! To learn more about visiting this valued member of the HAHS program see the site in our directory at www.artistshomes.org. Listen to a recent radio interview with Kinney Frelinghuysen on WAMC.org.